A little more than 11 years ago, one of the creators of Tor, and the current President of the Tor project, Roger Dingledine, gave a talk for the members of the Norwegian Unix User group (NUUG). A video of the talk was recorded, and today, thanks to the great help from David Noble, I finally was able to publish the video of the talk on Frikanalen, the Norwegian open channel TV station where NUUG currently publishes its talks. You can watch the live stream using a web browser with WebM support, or check out the recording on the video on demand page for the talk "Tor: Anonymous communication for the US Department of Defence...and you.". The isenkram system is a user-focused solution in Debian for handling hardware related packages. The idea is to have a database of mappings between hardware and packages, and pop up a dialog suggesting for the user to install the packages to use a given hardware dongle. Some use cases are when you insert a Yubikey, it proposes to install the software needed to control it; when you insert a braille reader list it proposes to install the packages needed to send text to the reader; and when you insert a ColorHug screen calibrator it suggests to install the driver for it. The system work well, and even have a few command line tools to install firmware packages and packages for the hardware already in the machine (as opposed to hotpluggable hardware). The system was initially written using aptdaemon, because I found good documentation and example code on how to use it. But aptdaemon is going away and is generally being replaced by PackageKit, so Isenkram needed a rewrite. And today, thanks to the great patch from my college Sunil Mohan Adapa in the FreedomBox project, the rewrite finally took place. I've just uploaded a new version of Isenkram into Debian Unstable with the patch included, and the default for the background daemon is now to use PackageKit. To check it out, install the isenkram package and insert some hardware dongle and see if it is recognised. The hardware mappings come from several places. The preferred way is for packages to announce their hardware support using the cross distribution appstream system. See previous blog posts about isenkram to learn how to do that. Yesterday I updated the battery-stats package in Debian with a few patches sent to me by skilled and enterprising users. There were some nice user and visible changes. First of all, both desktop menu entries now work. A design flaw in one of the script made the history graph fail to show up (its PNG was dumped in ~/.xsession-errors) if no controlling TTY was available. The script worked when called from the command line, but not when called from the desktop menu. 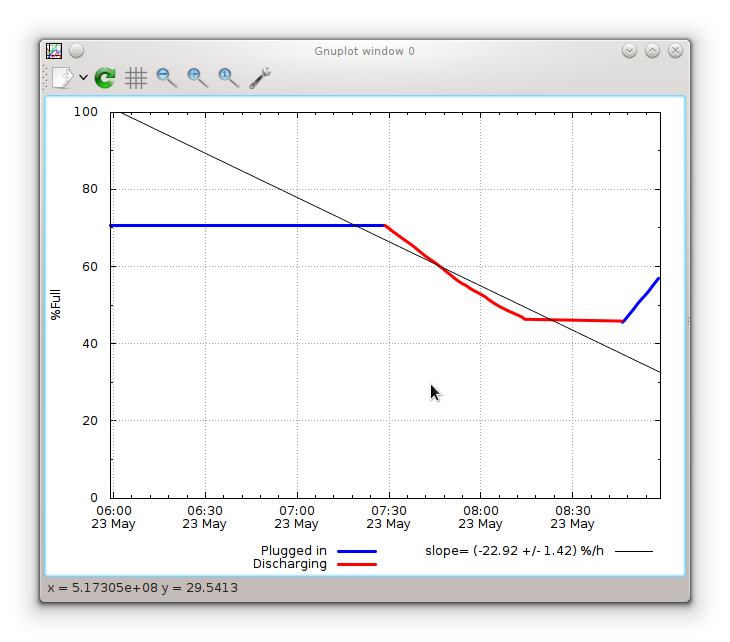 I changed this to look for a DISPLAY variable or a TTY before deciding where to draw the graph, and now the graph window pop up as expected. The next new feature is a discharge rate estimator in one of the graphs (the one showing the last few hours). New is also the user of colours showing charging in blue and discharge in red. The percentages of this graph is relative to last full charge, not battery design capacity. The last new feature is in the collector, which now will handle more hardware models. On some hardware, Linux power supply information is stored in /sys/class/power_supply/ACAD/, while the collector previously only looked in /sys/class/power_supply/AC/. Now both are checked to figure if there is power connected to the machine. 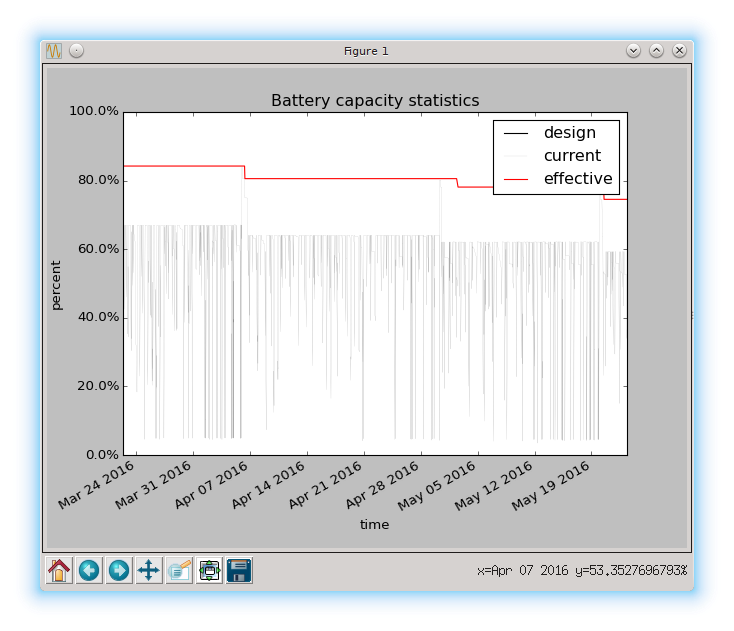 If you are interested in how your laptop battery is doing, please check out the battery-stats in Debian unstable, or rebuild it on Jessie to get it working on Debian stable. :) The upstream source is available from github. Patches are very welcome. A few weeks ago the French paperback edition of Lawrence Lessigs 2004 book Cultura Libre was published. Today I noticed that the book is now available from book stores. You can now buy it from Amazon ($19.99), Barnes & Noble ($?) and as always from Lulu.com ($19.99). The revenue is donated to the Creative Commons project. If you buy from Lulu.com, they currently get $10.59, while if you buy from one of the book stores most of the revenue go to the book store and the Creative Commons project get much (not sure how much less). I was a bit surprised to discover that there is a kindle edition sold by Amazon Digital Services LLC on Amazon. Not quite sure how that edition was created, but if you want to download a electronic edition (PDF, EPUB, Mobi) generated from the same files used to create the paperback edition, they are available from github. I just donated to the NUUG defence "fond" to fund the effort in Norway to get the seizure of the news site popcorn-time.no tested in court. I hope everyone that agree with me will do the same. In March 2016, the Norwegian police seized (as in forced NORID to change the IP address pointed to by it to one controlled by the police) the DNS domain popcorn-time.no, without any supervision from the courts. I did not know about the web site back then, and assumed the courts had been involved, and was very surprised when I discovered that the police had hijacked the DNS domain without asking a judge for permission first. I was even more surprised when I had a look at the web site content on the Internet Archive, and only found news coverage about Popcorn Time, not any material published without the right holders permissions. The seizure was widely covered in the Norwegian press (see for example Hegnar Online and ITavisen and NRK), at first due to the press release sent out by Økokrim, but then based on protests from the law professor Olav Torvund and lawyer Jon Wessel-Aas. It even got some coverage on TorrentFreak. I wrote about the case a month ago, when the Norwegian Unix User Group (NUUG), where I am an active member, decided to ask the courts to test this seizure. The request was denied, but NUUG and its co-requestor EFN have not given up, and now they are rallying for support to get the seizure legally challenged. They accept both bank and Bitcoin transfer for those that want to support the request. If you as me believe news sites about free software should not be censored, even if the free software have both legal and illegal applications, and that DNS hijacking should be tested by the courts, I suggest you show your support by donating to NUUG. The machine is a complete ARM-based PC with micro HDMI, SATA, USB plugs and many others connectors, and include a full keyboard and a 5" LCD touch screen. The 6000mAh battery is claimed to provide a whole day of battery life time, but I have not seen any independent tests confirming this. The vendor is still collecting preorders, and the last I heard last night was that 22 more orders were needed before production started. As far as I know, this is the first handheld preinstalled with Debian. Please let me know if you know of any others. Is it the first computer being sold with Debian preinstalled?